Featured offers in this Sears flyer: $1199.99 LG 6.3 cu. ft. True Convection Range; $1499.99 LG 21.8 cu. ft. Fridge With Bottom Freezer; $1679.98 LG Front-load and Laundry Pair; $1499.98 LG Laundry Pair With Front Controls; $1299.99 Craftsman 24″ Snowblower; $799.99 Serta Caliente III Pillow-top Queen Size Sleep Set; $649.99 Kenmore 5.3 cu. ft. Range; $649.99 Kenmore 18.2 cu. ft. Fridge with Top Freezer; $399.99 Kenmore Tall Tub Dishwasher; $599.99 Kenmore 24″ Built-in Tall Tub Fully-Integrated Dishwasher; $799.99 NordicTrack T6.5 S Treadmill; $599.99 NordicTrack T 5.0 Treadmill; $799.99 Bowflex Xceed Home Gym; $1299.90 Kenmore Front-load laundry pair with AST; $719.99 Beautyrest Sovereign Tight-Top Queen Size Sleep Set; $799.99 Beautyrest Sovereign High-Loft Pillow-Top Queen Size Sleep Set; $1259.99 Kingsdown Ashworth Euro-top Queen Size Sleep Set; $1399.98 Kenmore Laundry Pair; $1799.98 LG Front-load Steam Laundry Pair; $449.99 Frigidaire 1.7 cu. ft. Over-the-Range Microwave; $1399.99 Frigidaire 5 Cu. Ft. True Convection Gas Range; $1169.99 Kingsdown Hudson Tight-top Queen Size Sleep Set; and more. 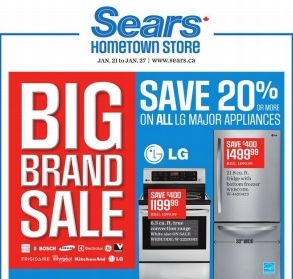 Find all deals and offers in the latest Sears flyer for your local store.